When Dee asked me to write a post on winter essentials, I didn't know if I had anything to contribute. After a little reflection, there were a few items that I absolutely couldn't live without during these cold Canadian winters. Let's start with a little outerwear. Let's fact it, here in Canada we have cold winters. Cold winters mean lots of snow and windchill. For some freakish reason, our kids still want to go outside and play. Since it is inevitable that we will be forced to spend an undetermined amount of time outside, we must keep our heads and ears covered and warm. That is why I wear this tuque almost daily. I love this tuque. I bought it at craft sale a few years back and it is still my favorite. I feel like if I had a daughter she would own 6 of these hats because they look great on young girls to. Even my Grandma could pull this tuque off. They look good on everyone. I've talked about my love for infinity scarves before, but I've never addressed outdoor scarves. 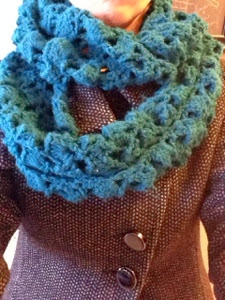 About a year ago, my friend Carmen started knitting scarves and just recently she started her own little business KoLi Designs. Her stuff it the best. 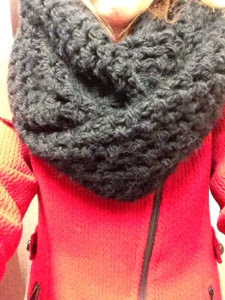 I started with this blue scarf and wore it so much that I needed one to go with my red jacket to. So... I ordered this one to. I gave 2 away as gifts for xmas and I nearly kept them both for myself I love them so much. 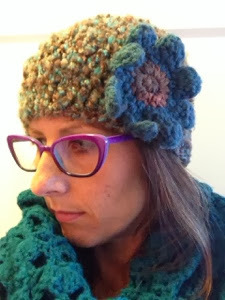 I also received a slouch hat as a gift. I promise that you won't be disappointed. Check her out! I have a pair of black, brown and grey tall boots. I love them all. Earlier this year I forced myself to buy a pair of black ones because I didn't have any I never knew how much use I would get out of them. If I were to only buy one pair, I would still buy brown, but I've come to realize that black is pretty important too! I mostly wear my tall boots to work with skirts in the winter with tights or with leggings. Most of my pairs aren't suitable for outdoor wear because of their lack of grip and warmth. But on a cold day when you feel like wearing a skirt, they are essential. For an added bit of 'winter', on non slippery days I use this older pair of brown boots to wear around on the weekend with my boot cuffs. Love my boot cuffs. It is just one of those little details that can make an outfit. I picked up this pair on Etsy a few years back. I don't get as must use out of them as I hoped but when I do put them on, I love them! This is what they look like. They aren't a full sock, just a little wool cuff made to stick out of your boot. The only trouble I've run into with them, is of all my boots, they only fit in my slouch pair of boots. There isn't enough room in the others. Bare in mind I have wide calfs and some boots don't zip up on me. If you are going to spend some time outside you need to have a good winter boot. This is what I currently have. While they are warm and relatively comfy for a full on winter boot, what I am really lacking in my winter wardrobe is a more fashionable winter boot. Yes, this is great for sledding, shovelling, playing in the snow, but if we are going for groceries, a play date, soccer etc. I'd prefer something a little less out there. I've looked around and really like this boot. They are fur lined and have a rubber heal for outdoor wear. 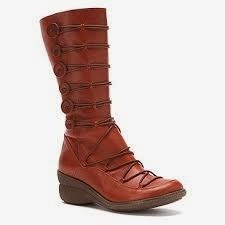 Ideally, I'd wear these at home and around town with the kids and wear the regular tall boots to work. 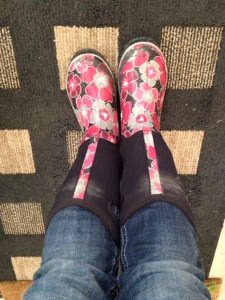 I may have bought these boots after composing this post for a great deal. How could I pass them up? I struggled with what a tunic was for a good portion of the fall. Essentially just a long shirt that works great with leggings. One that can easily be worn with leggings. At the moment I have 2 and I love them both. For some reason, to me, tunics are worn with leggings only. I fear that they would stick to my jeans and be uncomfortable. These are the most comfy outfits and perfect for a cold day when jeans are just not happening. Throw on a scarf or a necklace and you feel and look great! I've just re-entered the world of sweaters. After years of having young kids around pulling on your clothes with their dirty little hands and wiping their snot on your shoulders, I stayed away from sweaters since they take so much time and effort to wash. I think now we are out of that stage (quickly... knock on wood) and I have slowly reintroduced a few sweaters to my wardrobe. Although I hate the terrible weather that comes with winter, I do love fall/winter fashion. Layering, scarves, boots, sweaters..... all things I love! So if it is going to be cold outside I might as well embrace it and dress for the weather..... fashionably of course! With that being said, I am very ready for spring! I somehow missed this fabulous post! Looking good ChristY!